Between July 18th and July 29th, Denver Solid Waste Management is switching its Stapleton customers to a standardized, cart-based trash service utilizing City-issued trash carts. To help get rid of unwanted manual trash containers after this transition, Denver Recycles is hosting a one-day recycling collection event for these containers. 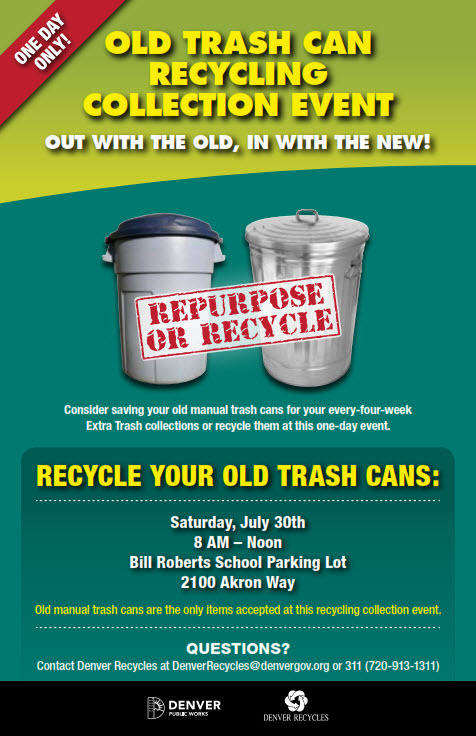 Mark your calendar today, and bring them your old, unwanted trash cans to be recycled or repurposed on July 30th. No other items will be accepted at this collection event. Cleaner Alleys and Neighborhoods: Carts reduce illegal dumping and litter. Increased Recycling: Carts have proven to increase recycling. Improved Collection Efficiency: Switching to one type of service citywide helps increase the overall efficiency of Solid Waste Management collections. For more answers and to stay up-to-date on the cart conversion, visit DenverGov.org/SolidWastePlan or call 311 (720-913-1311). You can usually call up the dumpster rentals and describe the size from the job plus they can suggest a container size for the job. It is important to consider the weight of the disposables as well, as it will modify the truck’s carrying capacity. Opt for in which the dumpster will be placed as some residential or commercial areas may need a permit to fit a disposal container.